In his seventh season in English football, Schneiderlin has never scored two goals in a game before. Morgan Schneiderlin scored twice as Southampton picked up a first Premier League win under Ronald Koeman with a comfortable victory at West Ham. 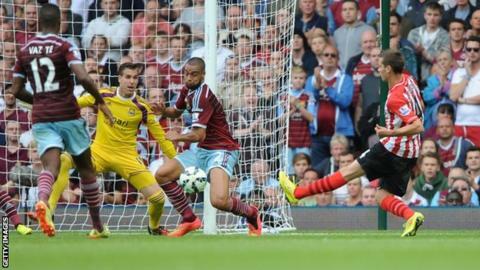 The Hammers led when Mark Noble scored with a deflected shot from 30 yards. But the Saints equalised as Schneiderlin turned in at the second attempt from Dusan Tadic's free-kick. Schneiderlin finished from James Ward-Prowse's cross before Graziano Pelle made it three after Nathaniel Clyne's right-wing cross was blocked by Adrian. After a difficult start to life at Southampton, with a host of his top players moving on, the only disappointment for Koeman was that his team squandered chances to make it an even more routine afternoon. Rickie Lambert, Adam Lallana, Dejan Lovren, Luke Shaw and Callum Chambers all left in the close-season but Schneiderlin was told he would not be allowed to follow them, despite interest from Tottenham. The Frenchman has since started all three of his team's Premier League matches and demonstrated why his club are so keen to keep him when he brought them level moments before half-time and gave them the lead halfway through the second period. Italian striker Pelle, a summer signing from Feyenoord, added a third to ensure the scoreline went some way to reflecting a dominant performance. The Hammers, who paraded loan signing Alex Song before kick-off, looked nothing like the ruthless side that had cut through Crystal Palace in a 3-1 win last week. Having only won seven home matches in the Premier League last season and with manager Sam Allardyce under pressure to play more attractive football, they have now lost all three games in front of their own fans in the new campaign, including a League Cup exit on penalties to League One Sheffield United. The hosts did, however, make the most of a brief spell of pressure just before the half-hour. First Stewart Downing saw his free-kick blocked, then Ricardo Vaz Te had a low effort turned wide by the foot of Fraser Forster. And they moved in front when Mauro Zarate robbed Schneiderlin in midfield and found Noble, whose effort from long distance glanced off Maya Yoshida and past Forster. But the hosts could not protect the lead even as far as the interval. Pelle had a header cleared off the line by Aaron Cresswell before Tadic's free-kick from the left found Schneiderlin on his own at the far post. The midfielder's first attempt was blocked by Joey O'Brien, but he curled in at the far post with his second. After the break, Southampton's Shane Long had a drive pushed around the post by Adrian following a smart turn and Tadic could only produce a weak effort, also saved by the Hammers goalkeeper, after a quick break. From the corner that followed, Schneiderlin lifted a shot well over the bar from around eight yards. With West Ham complaining they should have had a goal kick, Southampton took a corner quickly, Ward-Prowse picked out Schneiderlin and he turned in at the near post to punish loose defending by the home side. Southampton were still doing all the attacking and sealed the win when Clyne's cross was palmed away by Adrian and Pelle thumped in the rebound on the half-volley. "We weren't good enough. Southampton taught us a lesson. We weren't sharp enough, didn't retain the ball as well as they did or close down as well as they did, and we gifted them two goals. "As much as they were in control and on top of the game, we've lost two very stupid goals from set-pieces. "The big problem I had with the corner [for the second goal] was that it was a goal-kick of course. Having looked at it from [referee] Mike Dean's position, he's got it horribly wrong when we don't need it to go against us." "After they went 1-0 up it was difficult with the second ball because they played the long ball and long throw-ins. We knew that but we didn't dominate it and luckily it was 1-1 near half-time and that gave us belief to play and play to win. That's what I liked in the second half - we played with pressing, deserved to win and scored some great goals. "Morgan Schneiderlin is a great player and it's normal that we like to keep that kind of player in our squad. He was wonderful in midfield. He has great quality and I enjoyed it. "We said that from the beginning [that Schneiderlin will not be leaving] and we'll keep that until the end [of the transfer window]." Match ends, West Ham United 1, Southampton 3. Second Half ends, West Ham United 1, Southampton 3. Corner, Southampton. Conceded by Stewart Downing. Foul by Gastón Ramírez (Southampton). Winston Reid (West Ham United) wins a free kick in the defensive half. Dusan Tadic (Southampton) wins a free kick on the left wing. Foul by Joey O'Brien (West Ham United). Mohamed Diamé (West Ham United) wins a free kick in the defensive half. Jack Cork (Southampton) wins a free kick in the defensive half. Jack Cork (Southampton) wins a free kick in the attacking half. Goal! West Ham United 1, Southampton 3. Graziano Pellè (Southampton) left footed shot from the centre of the box to the top left corner. Dangerous play by Graziano Pellè (Southampton). James Tomkins (West Ham United) wins a free kick in the defensive half. Substitution, West Ham United. Enner Valencia replaces Carlton Cole. Graziano Pellè (Southampton) is shown the yellow card. Foul by Graziano Pellè (Southampton). Aaron Cresswell (West Ham United) wins a free kick in the defensive half. Attempt saved. Graziano Pellè (Southampton) right footed shot from a difficult angle on the right is saved in the bottom right corner. Assisted by Dusan Tadic. Gastón Ramírez (Southampton) wins a free kick on the right wing. Offside, West Ham United. Adrián tries a through ball, but Ravel Morrison is caught offside. Foul by Morgan Schneiderlin (Southampton). Stewart Downing (West Ham United) wins a free kick in the attacking half. Attempt missed. Winston Reid (West Ham United) right footed shot from the centre of the box misses to the right. Assisted by Adrián following a set piece situation. Substitution, Southampton. Jack Cork replaces James Ward-Prowse. Goal! West Ham United 1, Southampton 2. Morgan Schneiderlin (Southampton) right footed shot from very close range to the bottom left corner. Assisted by James Ward-Prowse with a cross following a corner. Attempt blocked. Gastón Ramírez (Southampton) header from the centre of the box is blocked. Assisted by Dusan Tadic with a cross. Substitution, Southampton. Gastón Ramírez replaces Shane Long. Attempt saved. Shane Long (Southampton) right footed shot from the left side of the box is saved in the centre of the goal. Assisted by Dusan Tadic. Joey O'Brien (West Ham United) is shown the yellow card for a bad foul.